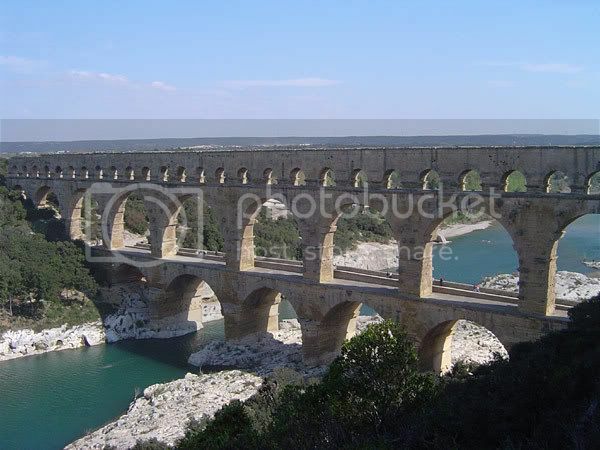 The Pont du Gard is part of a Roman aqueduct system located in France- specifically, the section of the aqueduct that crosses the Gard River, in southern France. The size of the aqueduct it is a part of is approximately 30 miles. Pont du Gard was built by Roman engineers in either the year 19 BC (according to tradition) or 40-60 AD (according to newer excavations.) If the traditional model is accepted, then it is likely that it was built at the behest of Augustus Caesar's son-in-law, who was charged with providing water to Rome's colonies. A recent detailed analysis of the intact remains of the aqueduct found that waterflow was likely between 200 and 400 liters per second. Unbelievably, the aqueduct is considered “sloppy” by Roman standards. This stems from the fact that the aqueduct was built inefficiently, as compared to later aqueducts of similar size which required far less stone and concrete to produce. The aqueduct functioned well enough for public use until about 900, AD. It was then that centuries of disrepair had choked off its water supply. Thereafter, it functioned as a toll bridge- well into the 1800's. It wasn't until the mid-1800s that the Pont du Gard got a face lift, and was restored to its original beauty by Napoleon III.